Enjoy panoramic images from this location and check out also the available virtual tours Feel like being there and look around yourself! 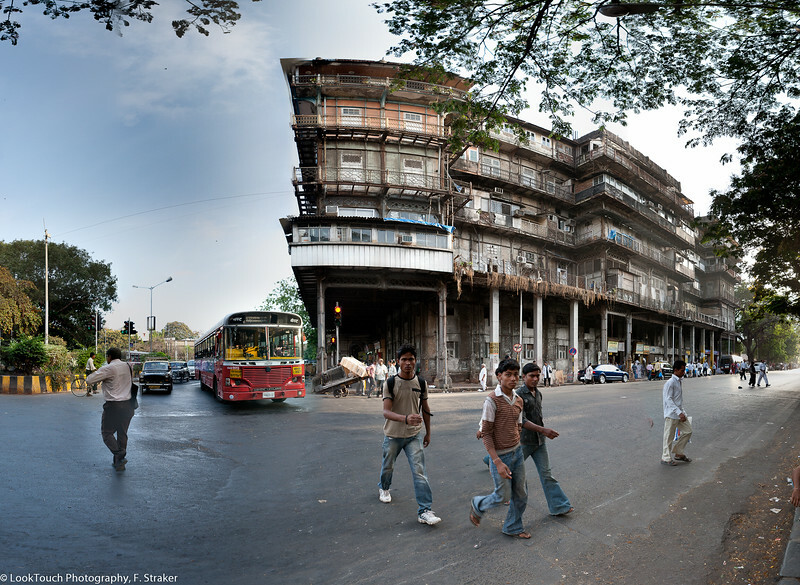 One of the busiest traffic intersections of Mumbai is right in front of the famous train station. A dead body is carried in procession to the cremation ground. "Ram Nam Satya Hai" (The name of Ram is truth) is commonly chanted while carrying a dead body to the cremation ground in India and Nepal. This recitation implies that the dead body no longer sustain the truth (breath) which is Ram Nam. The dead body devoid of the breath or Ram Nam has no value whatsoever. In search for food monkeys jump from roof to roof. Did you spot one? Ponton bridge accross the Ganges river, Varanasi A constant stream of vehicles and pedestrians is crossing the Ganga on this bridge. Actually forbidden for vehicles a little "donation" to the gatekeeper makes the way free. Quite often it is a miracle how the larger vehicles can pass on that narrow path. Washing laundry in the blazing heat is exhausting. The water level of the Ganga can rise dramatically. Occasionally it reaches up to the terrasse of the Suryauday hotel (white building in the left center). Once owned by the Royal Family of Tibet it is now an upscale hotel. View towards Bandra from the edge of Dharavi. The film Slumdog Millionaire has made this pair of huge pipes famous. Occasionally you see residents using this shortcut towards Bandra until in about 1km the pipes agian vanish underground. For me this pipes stand for the dreams and ambitions of many Daharvi locals moving towards a better life by pursuing a sometimes unusual path. Streetcorners of the world is an ongoing long-term project. Offering a view into everyday life of familiar and different places every image is an invitation to contemplate and discover the large amount of details and clues. Every image is an invitation to let the story of the moment and location unfold in the viewers imagination. For many festivals around the year idols or statues of the gods are needed. 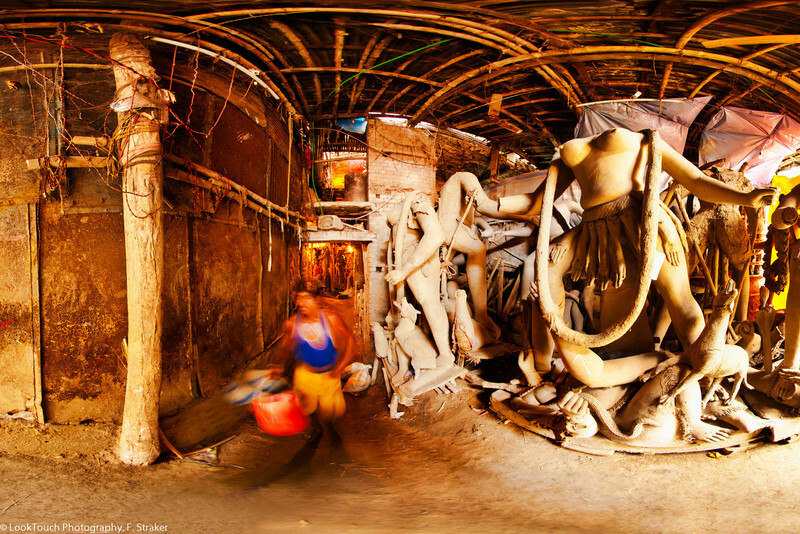 In the Kumartuli quater of Kolkata the specialized businesses are concentrated. Pottery workshops produce the bodies from straw and clay, painters will do the finishing and maker of cloths and accessories will complete the outfit of an idol. Durga idols are dropped into the Ganges river at the last day of the puja. Therefore the production of next year's demand of statues will start shortly after the puja has ended. Baghbazar has been, along with neighbouring Shyambazar, the citadel of the Bengali aristocracy. Bagbazar has played an active role in growth and development of Kolkata. Quiet and clean it is the home of the more wealthy part of the population. Nobody will leave the corner shop without a chat and exchange of the latest news. A refreshing drink of fresh coconut milk makes many people stop here. Very skilled with a large blade the vendor holds the coconut in his palm and fearlessly hacks away with a large blade until the juice can be drunk. He even cuts out a little spoon for scraping out the meat.